Individual heater elements positioned to provide coverage of the Infrared Waves. Large Panel Heaters, which provide a more even heating with the Infrared Waves. Both Carbon Fiber Infrared heaters and Ceramic Tube Infrared heaters emit the same Infrared waves. Ceramic Tube has been around the longest and Carbon Fiber is a new style / technology in infrared heaters. Ceramic Tube heaters are long skinny tubes that emit IR waves in all directions, thus reflectors are used to reflect the IR waves from the backside of the tubes into the sauna. The limitation is that they can create areas of concentrated IR waves (you’ll feel hotter there) and areas with limited IR waves (you’ll feel colder in those areas). IR waves are thermal heat, like the sun’s rays. They heat up what they "bump" into. If you stand in the sun, you feel hot, but when you step in the shade, you feel cooler, even though the air temperature didn’t change. 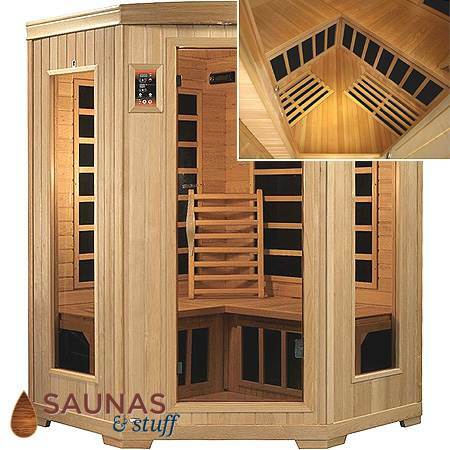 Infrared waves work similarly, thus you can have hotter and cooler areas in the sauna, depending on the intensity of the Infrared Sauna wave pattern. A key purpose behind the carbon panel heaters is to create a more even overall pattern of Infrared waves inside the sauna. The entire panel (covering very large areas of the walls, backs of benches, and even floor panels) emits an evenly distributed pattern of Infrared waves. 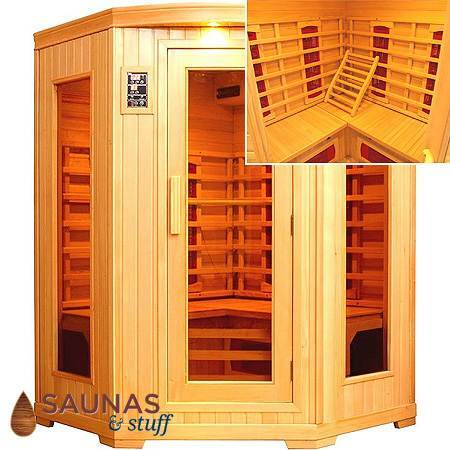 The goal is to more evenly heat up the sauna user, and hopefully get a full body sweat going. From customers who have had the opportunity to try both, there seems to be a preference for the carbon panel heaters. Human cells movement is in a certain frequency and our heaters simulate this movement. They use bio-spectrum radiant energy to directly penetrate the body’s tissues to a depth of over 1-1/2 inches. Their energy output is tuned to correspond so closely to the body’s own radiant energy that our bodies absorb close to 93% of the infrared waves that reach our skin. Our heater surface temperature is very homogeneous, with temperature fluctuations not exceeding 2%. Our heaters are highly efficient at creating thermal energy, with a conversion rate as high as 97%. Our heaters emit an energy wavelength spectrum of 5.6 - 15 microns bio spectrum wave, which is safe and offers the most benefit for our health. Infrared heaters radiant energy heats the object itself, instead of the surrounding air as in conventional heaters, so they can warm the object sooner and at lower temperature settings. Main components: two ceramic electrode ends, black bio spectrum ceramic tube, resistance coil, small quartz tube. Our bio spectrum ceramic tube is made of 100% ceramic composition (while in the market there heaters that have a variety of external colour coatings, which can come off easily). The resistance coil is even across the quartz tube to ensure the black ceramic bio spectrum tube heater can emit the bio spectrum wave homogeneously. Our carbon heaters are made of Mica. 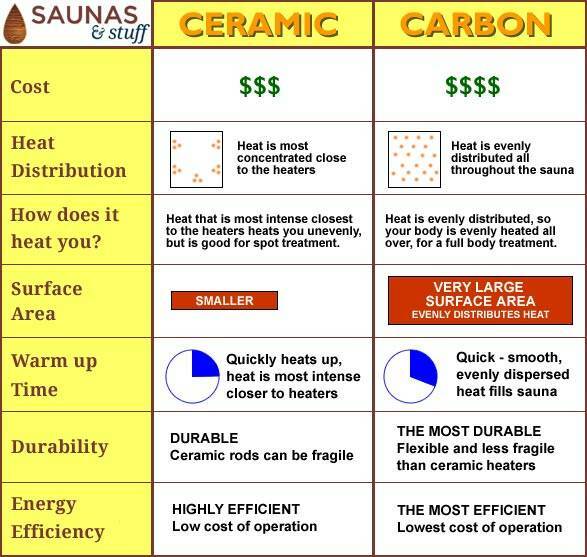 Carbon Mica heating systems, like the ones designed for use in all of our luxury saunas, are safer, cheaper and more efficient than normal coil-based heating products. Because the carbon mica panel has a larger surface area than heating coils, it can operate at a lower temperature, releasing the same amount of energy but over a larger area. Due to the properties of the material used, it holds its temperature for longer than a standard electric heater, much in the same way that a hydronic or oil filled heater would, which leads to higher efficiency. Carbon mica infrared radiant heat is so efficient that it can cost up to 40% less than conventional electric, oil or gas heating systems.